I'm trying something different again for this post! My skin has been pretty good since I've been sticking to this skincare routine for around 2 months now. It even held up during exam time which unfortunately hasn't been the case in previous years. I thought I could share the products I'm using and maybe this will be helpful for someone else. Maybe not. I should also mention that I have combination skin and I get spots from time to time. Also I feel like I should put a disclaimer just in case to say that none of this was sponsored or anything like that. Everything was bought with my own money. I used to have an Innisfree BB cream until they discontinued it. It was made for people with skin problems like acne and it really did help my skin. So when I read about this product I was confident it would work. And it has! I get spots less regularly and when I do they're usually small (more on spot killing later). It's also pretty good at taking off most make up but you might need to use something else for eye make up. It leaves your skin feeling fresh after you use it too. I bought mine from w2beauty since you can't get it in UK stores. This toner claims to minimize the appearance of pores which is why I got it. I'm not very attentive when it comes to my pores and sometimes I think there's a difference but other times I don't. Maybe that means it has helped with the elasticity of my pores? I'm not sure about that but I will still say it's a good toner. It does clean out my pores and helps with oil control. I also got this from w2beauty due to Etude House not being in the UK. I wish they did open up a store here, they're so cute and pink. I got this product since around February when I had pretty dry skin and was looking for something that would help. I kept coming across reviews of this product but I was put off by the £12.95 price tag which is more than I usually spend on moisturiser. I eventually decided to try it and I'm so glad I did. It really helped my dry skin and made my face nice and smooth again. You can also use it on your body and as hand cream. I bought this from steamcream.co.uk. 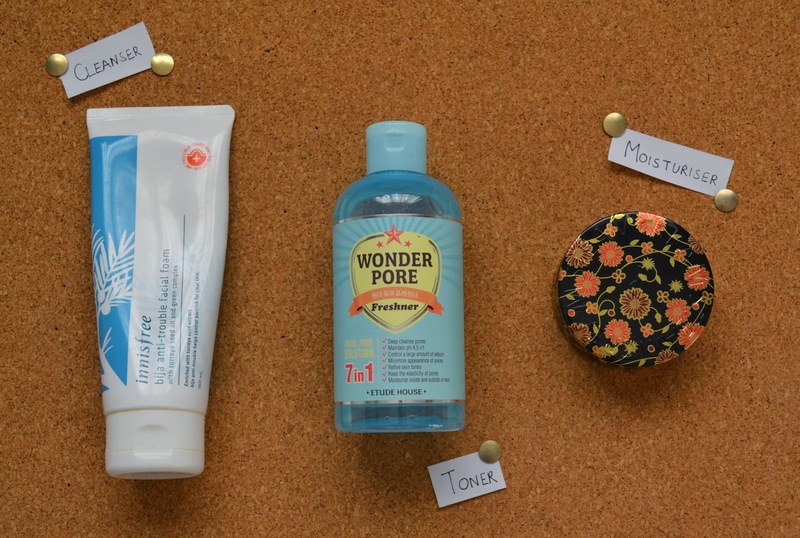 When I do get breakouts I tend to use these right when I spot them (PUN!). Tea Tree Oil: Everyone's probably heard of the savior that is tea tree oil by now. Sometimes I'll apply this directly to a spot using a cotton bud or I'll mix one or two drops with my moisturiser in my palm. I got this from Superdrug but it's also in Boots and other stores. Savlon: I saw my friend commenting on Facebook about using Savlon on spots so I thought I'd give it a try. I apply the cream directly onto a spot and let it work its magic. It helps to prevent pimples or at least reduce the size of them. I bought my tube at Boots. Honourable Mentions (a.k.a. I don't have either of these products right now to take pictures of): Sudocrem! I'm not sure if it works for nappy rashes but it's great for acne and I've been told it's good for dry skin. I've also used TCP liquid antiseptic on a spot and it had noticeably shrunk within two hours. However, this stuff smells very strongly and it's probably quite harsh on skin, so if you use it make sure to just dab a little bit directly onto the spot. Thanks for reading this post! If you found it helpful please let me know. I like doing beauty posts from time to time but I'll keep this place as a mainly personal style and nail art blog. I guess nail art does count as beauty though.